Short-lived perennial herb from a taproot; stems erect, crisp-cobwebby, unwinged, simple or sparsely branched above, 0.6-1.2 (3.0) m tall. Basal and lower stem leaves oblanceolate, up to 30 cm long; middle and upper stem leaves elliptic to oblong, 10-15 cm long, usually lobed 1/3 or 1/2 the width of the blade, sometimes nearly entire, margins bearing slender yellow spines up to 4 mm long, crisp-cobwebby above, often thinly woolly below. Heads discoid, 3-6, in a terminal cluster; involucres 2-4 cm tall; involucral bracts densely cobwebby, linear-lanceolate, not much graduated, outer ones tapering to a slender, 2-3 mm spine, inner ones unarmed, sometimes irregularly-margined and twisted; disk flowers purplish-red, rarely white, 20-25 mm long, the tubes 12-18 mm long, the lobes 2-4 mm long; styles exserted out of the tubes about 1.5 mm or included. Achenes 4-4.5 mm long; pappus 18-22 mm long, buff or light brown, subequal to the corolla. 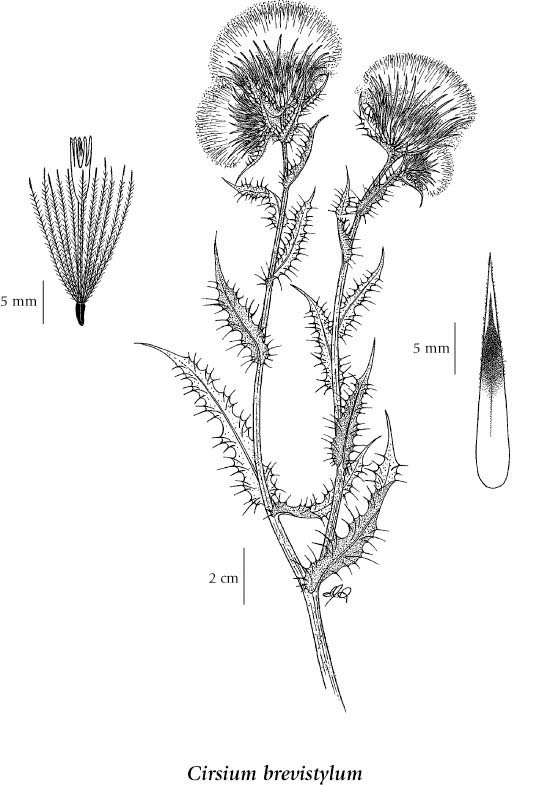 A natural hybrid between Cirsium brevistylum and C. edule collected at several sites on S Vancouver Island has been named C. x vancouverense Moore & Frankton. These plants, although most similar to C. brevistylum, have the longer (4 mm) exserted styles and leaf lobes of C. edule. Moist meadows and open forests in the lowland and montane zones; frequent in coastal and extreme S BC; S to ID, MT and CA.